Every time I visit my parents, I seem to come home with edible goodies of all sorts. 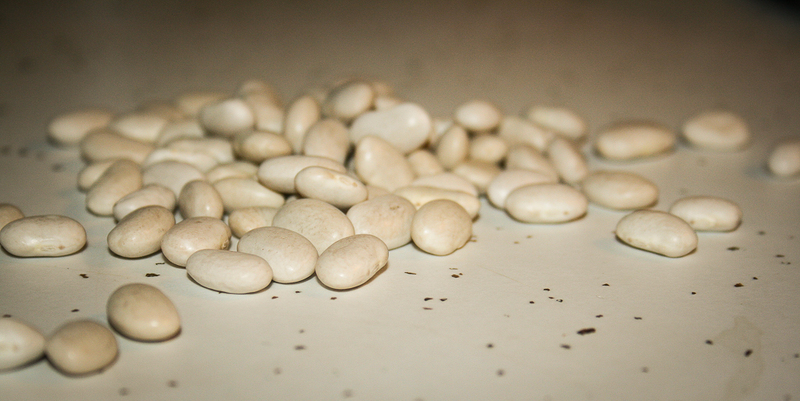 Be it freshly laid chicken eggs, cookies, interesting cheeses or any assortment of jerky. I have a feeling this may continue to happen no matter how old and self-sustaining I become. And, I must admit, I don’t mind it one little bit. A couple of weeks ago, I surprised my dad and went to stay with my family for the week. The prize I came home with this time? A ham. A really, really large ham. 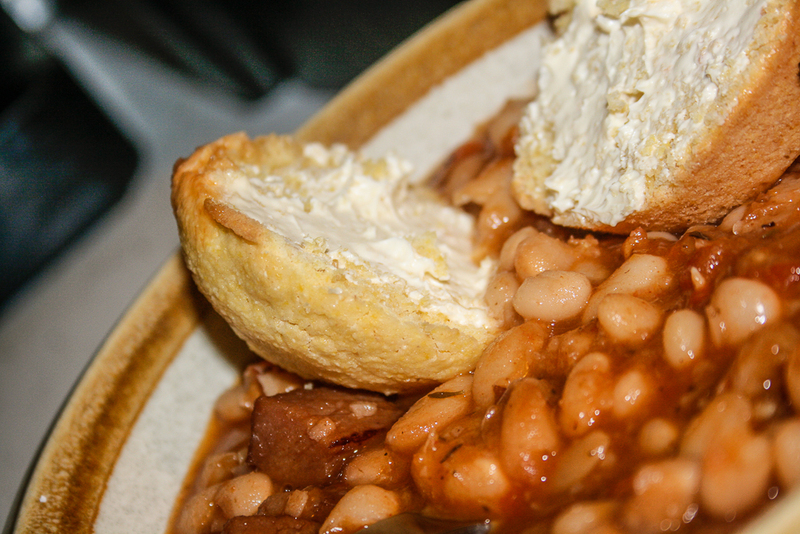 My husband has mentioned before that the only time he’s had ham and beans was when he was young at a Veteran’s Hall, and they were white, tasteless and made “ham and beans” not sound like an appetizing dish for the rest of his life. I was determined to change his view. Not that he even had to like them, just not continue to have that stigma. So, we set to work, using a little basic ham and beans recipe, a little Food Network’s recipe and a little our own twist. He had a second full bowl, so I’m considering it a success. 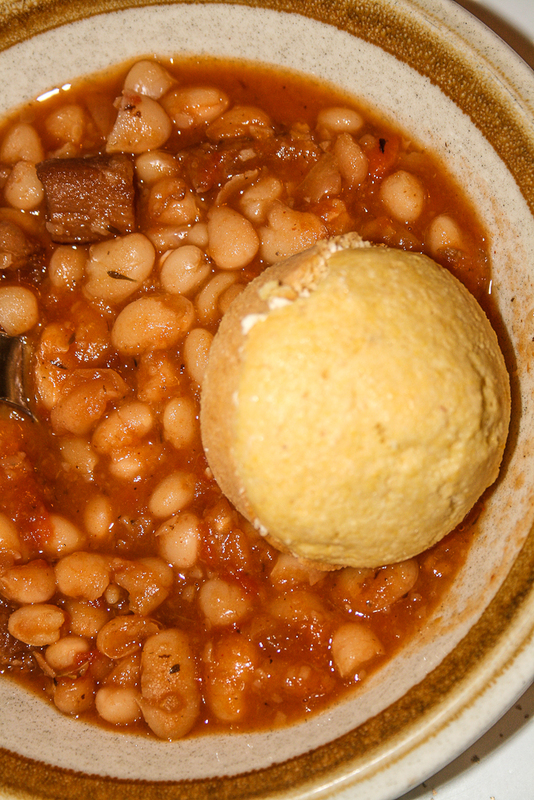 These beans are a little spicy, a little soupy and a top-notch choice if you’re looking for comfort food. The carrots and caramelized onions give it a rich sweet hint, which balances perfectly with the heat. And it’s ideal weather for this dish since it’s so hearty and filling, without being too heavy. First things first: soaking the beans. Give the beans a good rinse. Then, sort them and place them in a pot. 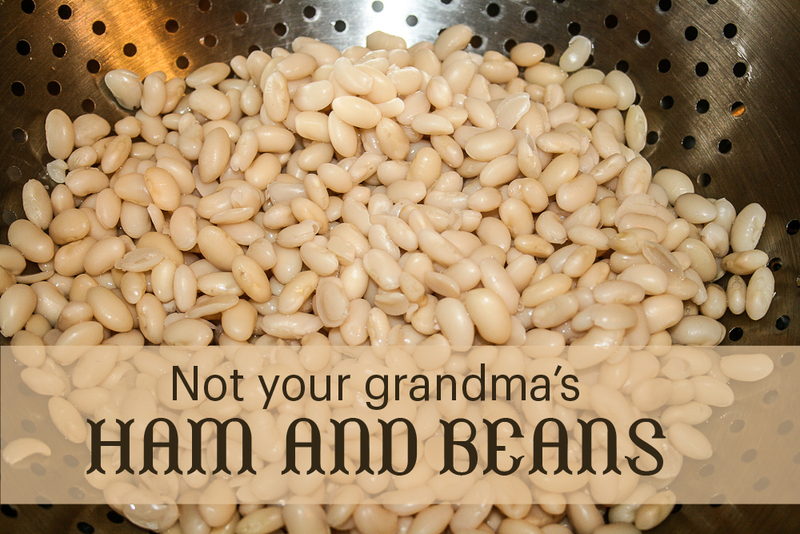 You can either choose to soak them in the pot overnight and then rinse and drain or do a “quick soak.” To quick soak the beans, add 6 cups of hot water to the pot with the beans and bring to a rolling boil. Let boil for two minutes, cover, remove from heat and let sit for one hour. Then rinse and drain again. 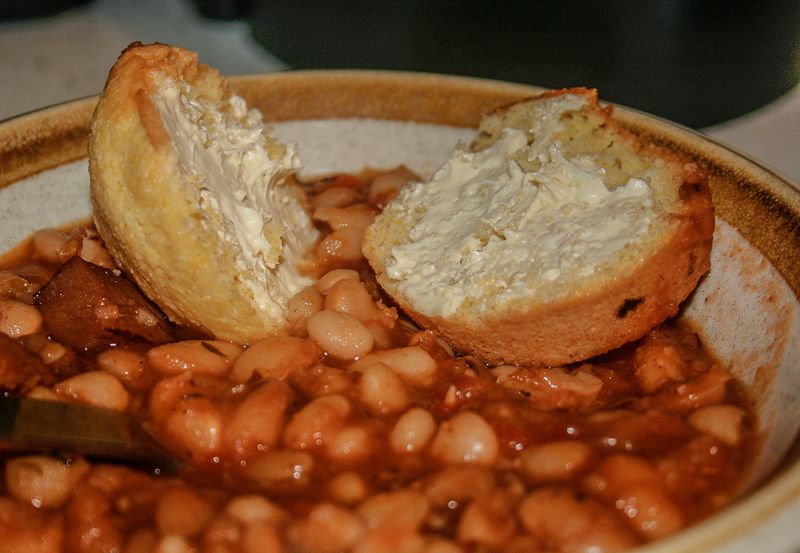 While beans are soaking, heat butter and olive oil in a pan over medium-low heat. When hot, add the onions and carrots and salt and pepper them. Once the onions begin to become translucent (10 minutes or so), add the cubed ham and garlic. Cook for another 15-20 minutes until the onions and carrots are very tender and nearly caramelized. 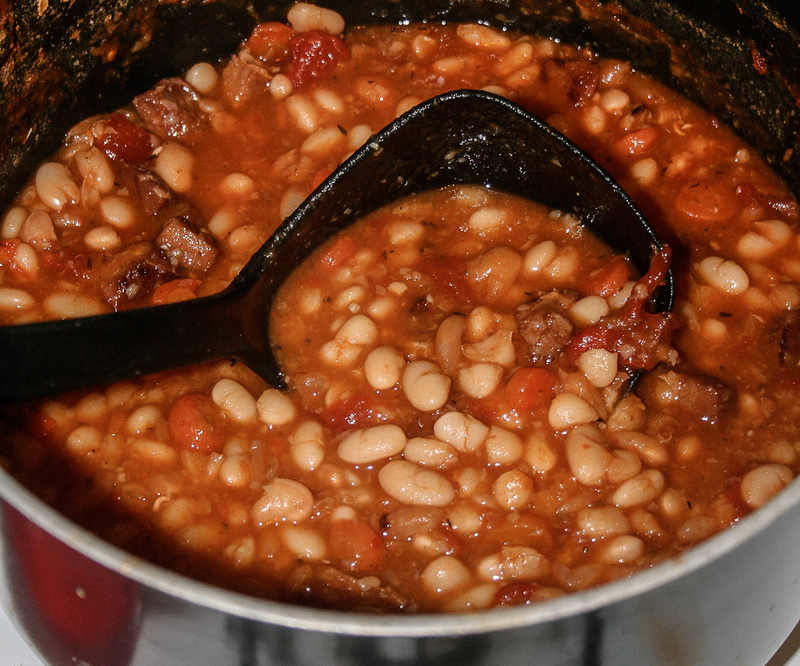 Once the beans are ready, add 5 cups of water to the beans and stir in onion and ham mixture. Add all remaining ingredients except tomatoes. Simmer on low partially covered for 1 hour 45 mins- 2 hours, stirring about every half hour. In a bowl, crush tomatoes by hand. Add the tomatoes and juice to the beans after an hour of cooking. At this point, you can also add more water if you would like it to be soup-ier. Serve hot with bread. I couldn’t resist making cornbread muffins to accompany it. Mmmm. Oh, and the flavor is even more developed after it’s refrigerated overnight, which works well since this makes a good-sized batch. I think even your grandma would approve!